Akeeaktashuk was leader of a group of seven families who lived at Uugarsiuvik (“place to look for cod”), located north of Inukjuak. 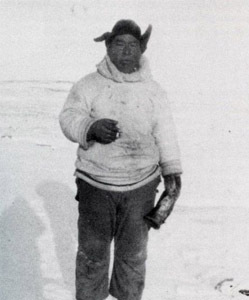 Frederica Knight, the wife of a Hudson’s Bay Company factor who lived in Inukjuak in the 40s, described him in First Passionate Collector as a “friendly, outgoing man, who was fairly unsuccessful as a hunter and trapper, but whose immense talent as a stone carver was immediately recognized” (Knight 1990:29). Sculpture. Akeeaktashuk carved soapstone and other stone, such as black ochre, and included ivory, wood, beads, sinew, bone, and thread to accentuate detail-work. As was typical among Inukjuak artists at the time, he used soap inlay to accentuate details of the stone. Akeeaktashuk used to “recline in his igloo carving replicas of birds or animals out of soapstone or ivory” (Tolboom in Wight 2006:30). Wight says that Akeeaktashuk was the most prolific carver in the early period of Inuit art: “A total of 58 of his carvings were located in various collections and publications, the most of any carver from this period” (Wight 2006:29). His sculpture, Man with Spear, was included in the 1952 National Gallery of Art exhibition in Ottawa, and two of his works were included in the May 1953 exhibition at Gimpel Fils Gallery in London, England. He was among the first Inuit artist to receive attention from southern audiences in books and the popular press, including Town & Country magazine in 1983. Wight notes that Akeeaktashuk’s early carvings were “small” but had “solid, well-defined and proportional” bodies detailed with soap (Wight 1990:108), while the eyes of his figures consisted of “deeply gouged slits” (Wight 2006:31). By 1953, however, Akeeaktashuk’s sculptures began to reflect a “stylistic change” (Wight 1990:85). For example, “the size of his sculptures had increased” and he began using “white and black concentric circles to represent eyes, instead of the horizontal ‘slashes’ characteristic of his earlier works.” By this time, he, along with other Inukjuak carvers, had also begun “gradually discontinuing the technique of accentuating details by pressing soap into incisions in the stone” (Wight 2006:30). Akeeaktashuk’s “short but intensive” artistic career lasted until he was relocated to an RCMP post at Craig Harbour on Ellesmere Island (Wight 2006:30). Soon after, the Canadian government relocated Akeeaktashuk and his family to present-day Grise Fiord in order to lay claim to the North during the Cold War. He reportedly died in a hunting accident in Grise Fiord in 1954. 1990 “Arctic Quebec,” First Passionate Collector. Winnipeg: Winnipeg Art Gallery: 27–30. 1950 The Montreal Daily Star, Montreal, 9 August. 1955 “Akeeaktashuk—Eskimo Carver.” The Montrealer, October. 2006 Early Masters. Winnipeg: Winnipeg Art Gallery. 1990 “The Handicrafts Experiment 1949–1953,” First Passionate Collector. Winnipeg: Winnipeg Art Gallery: 45–93.